Egypt's artists are coming out of hiding after decades in the shadows. The well-oiled wheels of the state propaganda machine have fallen off their axles and hope and colour are exploding on the streets. But with the hated Mubarak gone, can art still create a dialogue? This expressive, intelligent film gives a snapshot of a rumbling underbelly. As artists of all genres process the tumultuous politics plaguing the nation, there remains a deep fear of the unknown. Keizer is a street artist, working under cover of darkness educating the masses about the latest corruption. He fears self-censorship has yet to be undone as "people have created their own prisons." Elsewhere in Cairo street art is burgeoning in a joyful expression of freedom. "It's the first time that I walk past things like these that express happiness and contentment,"smiles an old man. Choreographer Karima Mansour's dance expresses the complexity of a society in which "We have veiled women, but we also have women like me. I am a dancer working with the body." She doesn't want to create specifically revolutionary art but something more timeless. We see reflected in her arresting work "moments of chaos, moments of joy, moments of exhaustion..." She now wants access to state-run theatres, something forbidden to independent artists under the old regime. Painter Khaled Hafez explains how the "deja vu images" seen on TV would resurface in all his early post-revolution paintings - the tanks, the guns, the soldiers... but gradually his art has become less literal. Yet for artist Hany Rashed the very act of depicting brutality is "a beautiful thing." Once, even photographing the police was forbidden, but during the revolution "I was able to take photos without anyone objecting. So I took a lot of photos of the police and then I turned them into paintings." During the Mubarak era the wheels of the state propaganda machine turned seamlessly from the Maspero building on the banks of the Nile. Ali Abdel Mohsen curates an exhibition entitled "Maspero" which remembers State Television "flip flopping back and forth" during the revolution, "no longer sure how to address the people." He says it was like watching a creature "in its death throes." Hany Rashed worked for state TV in Maspero for 15 years and experienced "the corruption and the fake news." One of his paintings depicts "my colleagues... my boss. The civil servants are like insects. They gather around him. Black and white, because it should feel like an old movie." Rami Essam is a musician who was arrested and beaten horribly even after Mubarak fell, because "the system didn't change yet." In the narrow Cairo streets he stages a pulsating concert aimed at children. "Even if they don't understand everything as long as they sing along, they will grow up alert and ask questions." And so the spirit of the revolution is passed on. As performance artist Sondos Shabayek puts it, "We wanted to take the spirit that we witnessed during the 18 days of the revolution and put it into a box where we can walk with it anywhere." "Every one of us was a diamond covered with mud" says singer Shaimaa Shaalan of her fellow artists. Their light is now being unearthed and, warns Khaled Hafez, the stakes are high. "If all Egyptians are aware of art they will not fall into the pit of fundamentalism." An expressive, intelligent film reflecting the vibrant, fluid Egyptian art scene. 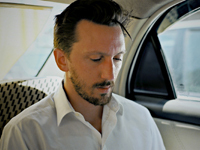 Heiko Lange, born in 1976, is a Berlin based filmmaker. He has worked as a director, writer and producer for TV shows, documentaries and music videos for more than 10 years. 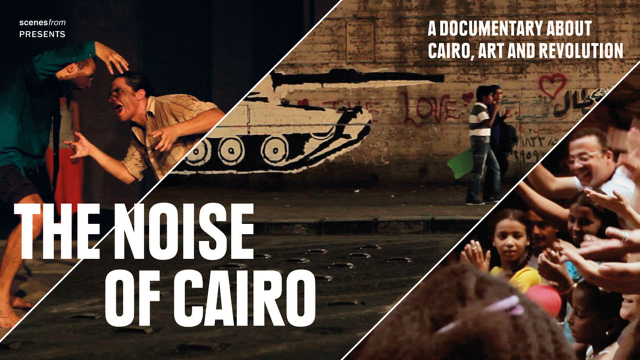 The Noise of Cairo is his first independently produced documentary. The idea for this documentary came while watching the beginning of the demonstrations in Egypt on Al-Jazeera. I was overwhelmed by the will of the people. So I watched the dynamic of the events on TV and after some days I started seeing all this evidence of creativity on the streets. All these posters, flyers, slogans, the chanting and the Egyptian humour. I was getting more and more interested in the creativity that comes out of such radical change and I started to wonder how this radical change would influence Egyptian art and the artists and what role artists played before, during and after the event. These were the questions I had in mind when I went to Cairo. It wasn't about giving the revolutionary art 'value' from a western point of view. I was more interested in the emotional debate from an artistic point of view.